Many tourists planning to embark on Cuba holidays dream about those romantic rides around the city on a convertible vintage car. Now, more than ever the majority of those travelling to Cuba boast about their time on the island with endless classic car images on social media. If they make you green with envy and you’ve wondered whether you can get behind the wheel of an old yank tank in Cuba, then this is the article you need to read. So, can you ride a classic car in Cuba? First of all, to quickly answer the above question on whether you can self-drive one of Cuba’s vintage wheeled beauties around town, the short easy answer would be no, you cannot, but the longer somewhat more complex one is perhaps…maybe. It depends. If you’re really keen on living that sort of experience during your Cuba holiday there might be a way or two around doing it, but it won’t be easy and you might not like it as much as you thought you would. Allow us to explain. Nowadays, if there is one thing that pops into the minds of people when Cuba is mentioned is doubtlessly the image of classic cars, cigars, straw hats and beaches, most likely in that order. The picture of an old American yank tank (so-called “almendrones” in the local lingo because of their large nut-like shape) roaming around Havana is pure romance with added old-world glamour. And after watching Prince Charles rolling around Havana in a British vintage beauty driven by the Prince of Wales himself you might be wondering whether doing this is a real possibility at the reach of the average tourist. 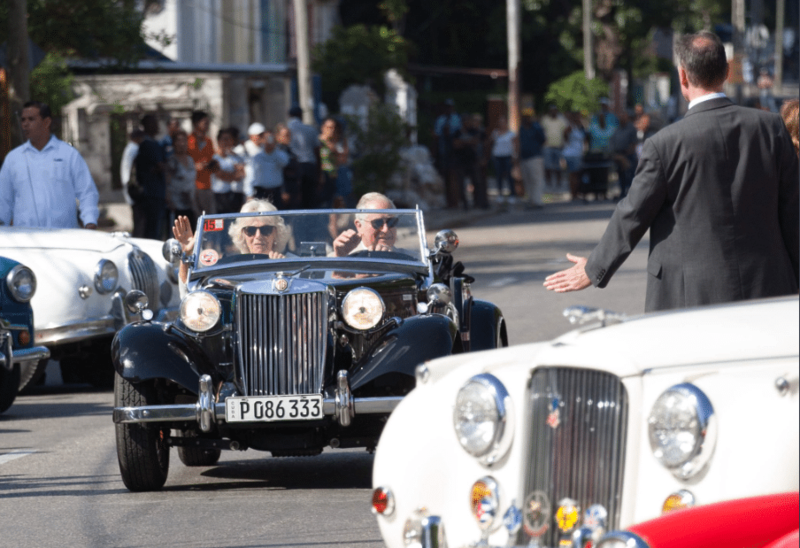 Well, we hate to have to break it to you, but Prince Charles enjoyed a rare privilege in Cuba because he didn’t just drive an old classic car in Havana, he drove a very rare, amazingly maintained MG Series DT Midget 1953, a British original. Well, he’s a prince (and future king) after all, so if any tourist could do this in Cuba, it might as well be him. Should I rule out the possibility of driving a classic car in Cuba then? That’s not to say that there is no way that you will get to drive a classic car in Cuba… you might, but be warned that classic car owners in Cuba are over-zealous (it’s not easy to keep these old vehicles running and owners treat them like their babies) and don’t set your hopes on driving any of the pristine-looking cars strategically lined up in some of the capital’s most touristic hotspots. These, in their vast majority, are owned by Gran Car or other government-run Cuban agencies, and can only be hired with driver included. There is a reason (or rather a set of reasons) behind the fact you most likely won’t be allowed to drive a classic car in Cuba (well, you definitely won’t be granted permission by official classic car rental companies and if you do get permission from a private classic car owner this will be at your own peril as it is not strictly legal). Firstly, while some of the well-preserved classic cars roaming Cuban streets indeed look pristine and in mint condition, once you lift the hood it’s a completely different story. It’s not by coincidence they have earned the nickname of rolling “Frankensteins” as due to lack of access to spare parts and the right maintenance tools, these cars continue to roll by virtue of sheer Cuban ingenuity. The U.S. embargo in place since the early 60s means that the island can’t import the right spare parts to fix these rolling dinosaurs so they’ve had to make do with alternatives. This means that all of the classic cars still roaming Cuban streets today have been significantly altered. They might not show on the outside it but inside they’ve been torn apart and repaired many times. None preserve their original engines, the majority have been replaced with diesel ones and Cuban classic cars contain a mixture of spare parts from all sorts of car models old and new, especially the Russian LADAs that also continue to roam the streets of Cuba today. What all this comes down to is the fact that only a classic car owner knows the tricks to driving their particular car. They’ve toiled around finding solutions to break-downs and have the “magical touch” to ensure they cause the car the minimum stress possible. These are rare, extremely delicate and fragile creatures, they might look powerful and mighty on the outside but they break down easily and frequently. You can understand then why owners might be cautious of letting you drive their prized oldtimers. With some persuasion (and a nice tip) some might agree to let you do a short drive, so if you can negotiate with the owner you are in for the experience of a lifetime…but bear in mind, it might not be as magical as you thought! They definitely look attractive, it’s definitely tempting to get behind the wheel of a Cuban classic car, but unless you’re an expert driver with some degree of experience driving old cars (and even then, Cuban cars take some getting used to!) it won’t be easy sailing. These cars are cumbersome to drive, they clank along with difficulty and are not easy to manoeuvre. So realistically speaking, if your heart is really set on doing it and you manage to persuade a classic car owner to let you drive it, keep it short and sweet in an area where you know (after having inspected it or by recommendation from the driver) there are no potholes (unfortunately those are very frequent in Cuba) or other terrain anomalies that might make your driving experience a living nightmare. Forget about cross-country style long drives around Cuba or covering any long distances. It’s not only really hard to get a classic car owner to agree to that sort of journey on your own, but it can also be really dangerous and you can be stranded for hours in the middle of nowhere. Count your lucky stars if you’re allowed a short drive around the block, it will give you the best of the experience without the hassle. Oh, and listen intently to the driver’s instructions, trust us you really want to! There is a reason that over 60,000 classic cars from the 50s (mostly), 40s and 30s continue circulating in Cuba’s streets and that’s out of sheer necessity. It’s not because they’re pretty (which indeed they are) or because Cubans have a natural predisposition to nostalgia (which to an extent is true). It’s because simply put, for many years they haven’t had a choice. Most of the classic cars in Cuba today have been made into convertibles (the majority weren’t originally so) and they have been prettied up to appeal to tourists. Booking a city tour with a driver isn’t exactly cheap but it’s an experience you shouldn’t miss out on, especially when they’re very flexible regarding the routes and they’ll adapt to where you want to go and what you want to see. Trust us, it’s so much better than driving these clanking beasts and without the added hassle and potential problems. Still, like we said if you want to try driving one for a block or two, the key is negotiating and having the right expectations. If your heart is really set on enjoying a long cross-country journey along Cuba in a classic car there are privately-owned companies like Classic Cars in Cuba that can take you from Havana to Trinidad, Cienfuegos, Bay of Pigs, Varadero and Vinales with set prices for each journey and the possibility of tailor-making your trip to reach other destinations. The only caveat is, you will be driven from A to B with an experienced driver and it’s unlikely they’ll let you get your hands on the steering wheel. But hey, listen, this is Cuba, so just sit back and enjoy the ride. You can always ask the driver to get behind the wheel for a fake driving picture that you (and your friends) will look longingly at for a long time after your holiday to Cuba has ended. And, don’t forget that for the most authentic Cuban experience you ought to book your stay in a casa particular, where the attentive hosts will add another cultural dimension to your trip. We at CubaCasa have an extensive variety of casas particulares in Havana and beyond. Actually, we cover all of Cuba and ours are handpicked quality casas with friendly service that you can trust so you’re in safe hands. Check us out!